Kelvin believes each and every one of us has an innate musicality within us, and it just requires some of his instruction for it to be revealed. He has spent years constantly refining his methods to make it ever more simple yet effective. The use of music therapy for children and adults with disabilities is widely regarded as enormously beneficial. Our approach focuses on students improvising, and we use techniques whereby our students take turns at improvising alongside the teacher. This is excellent for self esteem, creativity, social inclusiveness, and the engagement with others. Often non verbal students find they can express themselves via the music. Our workshops are an excellent opportunity for people to engage in a fun group activity whilst learning a new skill. We can tailor make a session to suit all budgets or time requirements. Once comfortable and confident, the students play a solo in front of their peers. The extroverts often really go to town and put on a performance! Carers report back saying that after attending a workshop the students are really uplifted, with a sense of achievement. Win win all around. 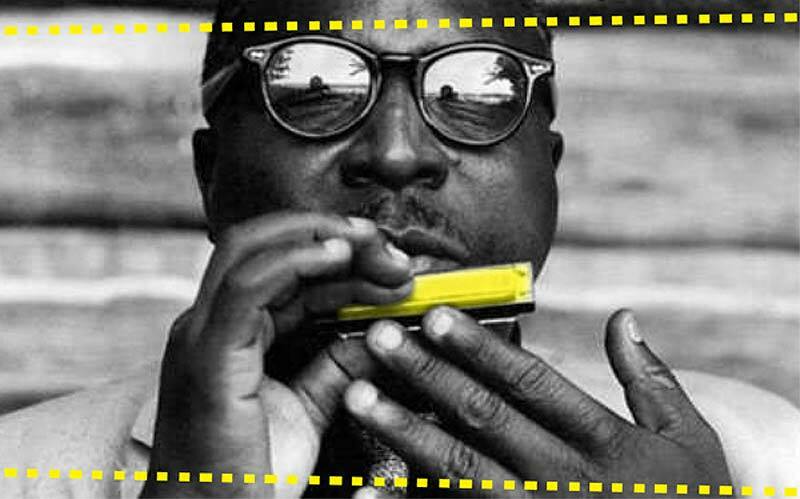 "The Cairns Regional Council would like to thank Kelvin for coming to Cairns and running one of his harmonica workshops. We ran his event for our disability sector so people with a disability were given an opportunity to learn a new skill, have greater social integration and just have fun. This was achieved as all attendees left the workshop laughing, playing their harmonicas and feeling great about themselves. Kelvin is an engaging mentor to the participants and I thoroughly recommend his workshops as a community building exercise and an inclusive community event." 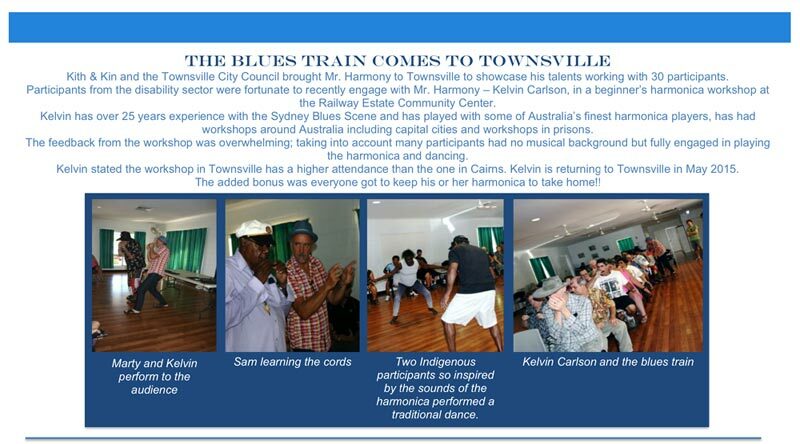 "Kelvin, (aka Mr Harmony) recently visited Townsville again to facilitate another harmonica workshop for Kith & Kin, whom support people with disabilities. The event was held at the Strand Ampitheatre, a beautiful shady open air spot with views to Magnetic Island. Kelvin had the attention of the whole group, and also listened to everybody individually to ensure that they reached the right notes. Lastly everyone performed a piece with a microphone. Everybody was happy with what they achieved and eagerly await the next workshop. WIN NEWS interviewed and filmed the group for that evenings 7pm news. Thanks Kelvin for sharing your knowledge & skills with our group, enabling each one of them to gain new skills in a fun filled environment". "Kelvin was recommended to run one of his harmonica workshops for teens with cerebral palsy. He believes music brings people together and includes them regardless of their disability. Kelvin gave each student his full attention, time and mentorship, something often overlooked for people with a disability. He was able to get the teens working together making wonderful music which even had their mentors dancing. An evening that left everyone feeling elated!"